We take mugs for granted! Mugs are our friends, they do so much for us yet we never give anything back. We pour boiling hot liquids into them yet they never complain. They contain tea and coffee and without these beverages many adults would become zombies. We drop them on t he ground and smash them yet they don’t rebel. Mugs have rights too! So next time you take a drink out of a mug remember to say thank you. You owe it that at least. P.S I wrote about the mug idea on another blog and even though I’ve changed it a bit it’s still the same idea. Don’t worry I’m not a copycat! 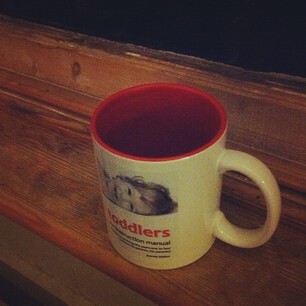 Also thanks to Jae for the picture of the mug ElDad bought her for X-mas. On the front is the cover from the book she wrote. January 4, 2012. Random wisdoms. It is spoons I feel sorry for. January 5, 2012 at 4:31 pm. Permalink.